As you may know, Thornton Sports have recently taken a new direction and our company is now available to take on installation work for their current jobs. Due to the company’s reshuffle, Sports and Safety Surfaces are stepping forward as an alternative contractor as we have completed many similar sports construction projects. We have now bought out many of the existing machinery and materials, as well as taking on previous staff members from Thornton Sports. As a result, our team are able to take over any planned work or provide new quotes for existing enquiries. After many years of successful trading, the business will begin a new approach which includes the closure of the manufacturing site for sports pitch materials. We feel that this offers the best choice for clients as materials can be purchased from a number of suppliers including Lano Sports and Playrite to offer the right product for every facility. Our team is now able to deal with any queries regarding existing projects so please don’t hesitate to contact us if you need any advice. If you have recently received a price quotation and are looking to place an order, please contact us and we would be happy to help you with what to do next. Our estimators will be able to send you another quote for the work you were looking to have done, and then carry out the construction so that your project can still go ahead. When companies cease trading it can be difficult for clients to know what they should do. As Thornton Sports alternative contractors we are here to answer any questions you might have, and resolve the situation so that any work you may have planned can continue. We understand that many schools, leisure centres, clubs and local facilities may be looking for a new company to build a sports surface so we are here to offer this service. Sports and Safety Surfaces has been trading for 19 years with an unblemished credit record, and we have carried out numerous sports and play construction jobs throughout the UK. If you are looking for an alternative contractor to complete the installation of these various facilities, please feel free to get in touch with us by filling in our contact form. Since buying out various pieces of equipment and material from Thornton Sports, we are able to deal with ongoing projects and ensure each client gets the facility they need. We install synthetic turf surfacing in a number of specifications including 3G, 2G sand filled and Multisport carpet. 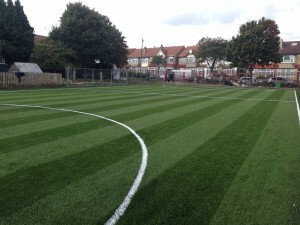 The 3G design contains a sand and rubber infill which is ideal for use with football and rugby if you are looking to create natural playing qualities. 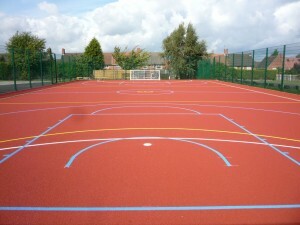 The 2G and Multisport synthetic surfaces can be used for a number of activities including football, tennis and hockey. These hard court surfaces are often used for MUGAs as they provide the perfect playing qualities for tennis, basketball, netball and general multi-sports. 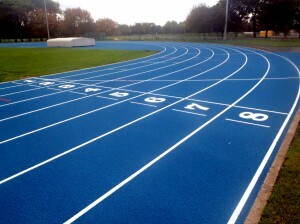 We are able to install these surfaces along with coloured paint coatings and vibrant line markings for the different activities. Facilities such as full sized running tracks, long jump runways and high jump fans can all be built by our team. We offer a number of surface types for these products including polymeric EPDM rubber and Multisport synthetic turf. If you are currently involved in a project with Thornton Sports or you have spoken with them regarding an enquiry, please get in touch with our team at Sports and Safety Surfaces today. We’ll be able to advise you on what to do if you have received a quote from the company whose work can now be transferred over to our team. Simply complete our enquiry form with the details of your project so we can provide you with a new quote or give some advice on what can be done next. « How Much is Astroturf?